Upgraded packages for 2004-2009 Prius include High Intensity Discharge (HID) headlamps that cast a crisper, brighter, cooler-colored light than conventional halogen bulbs. In automotive fashion, the improved visibility is of secondary importance to the impression that the car is high tech and sporty—implying the same of the person who drives it. 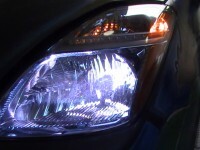 For Prius owners, when one of these bulbs goes out, the prevailing notion of HIDs is that they are absurdly expensive. Dealer price for one bulb is $314.23 (as of today) and rumor has it that service departments charge an additional couple hundred dollars for the physical replacement, since the procedure calls for removing the whole front clip. Two bulbs installed can run $900. The Prius is a terrifically economical car, and owners are rightfully shocked by the component failure as well as the cost to repair. The bulbs are thought to last longer (I’ve read up to 8 years), which validates their price, but try explaining that to the owner of a 2006 Prius with no headlights. Warranty coverage varies depending on the service writer on the other side of the counter. In true form, PriusChat has a hot thread regarding this problem. Discussion includes class-action plans to speculations of a bad batch around MY 2006. Our purpose at Luscious Garage is to fix the problem. After ardent research we found a direct source for OEM bulbs (Onex Brand D2R for MY 2004 and 2005, Philips Brand D4R 4300K for 2006 and up) for $94 each. We also offer upgraded bulbs that are brighter (Onex Brand D4R 6000K) and whiter in color, upon request. 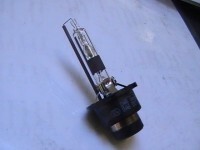 The bulbs can be changed from above, without removing anything, in a half hour. Two bulbs installed, with tax: $266. Due to overwhelming response LG is now willing to ship bulbs to individuals across the country. Email us through the contact page, including number of bulbs (1 or 2), your name, address, and phone number, and we will call you regarding payment. Price is $150/bulb including shipping.